General Manager of the Lagos State Emergency Management Agency (LASEMA), Mr. Adesina Tiamiyu on Thursday said the agency receives at least 100,000 calls daily from residents in the State via the emergency response number 767 and 112. Tiamiyu, who spoke to journalists in his office in Alausa, on the achievements of the agency, which is the umbrella body charged with the responsibility of coordinating the activities of relevant agencies in prevention and management of disasters in the State, has continued to upgrade its technical and manpower capacity to respond to the numerous emergency situations on a daily basis. According to him, since the upgrade of the Command and Control Centre in Alausa, the number of calls placed on the 767 and 112 emergency toll free lines in the State has increased from 15,000 daily to about 80,000 to 100,000 daily from across the State. “The administration of His Excellency, Governor Akinwunmi Ambode has invested heavily in increasing the capacity of our agency to respond to emergency situations anywhere in the State. It is a huge task, but I can assure you that we are capable to rise to the challenge and ensure that we continue to respond to such disasters promptly. “We are guided by the principle that prompt response to an emergency situation can save a life as well as properties. So, for us, we treat all calls as an emergency and dispatch our men to the spot immediately to access the situation, mitigate the situation and then facilitate for more assistance,” he said. The LASEMA boss also said that in a bid to scale up emergency response and take the service closer to the people, Governor Ambode approved the decentralization of the response centres from just one Response Unit in Alausa to three centres in Cappa in Oshodi; Lekki Ikoyi Link Bridge and Onipanu on Ikorodu Road, adding that plans are underway to establish additional three upgraded Dispatch Centres in Ijanikin by Adeniran Ogunsanya College of Education, Temu Junction, Epe and LASPOTECH in Ikorodu, as well as a fourth conventional LRU at Costain to cover Apapa Axis and its environs. He said while the Lekki Response Unit was strategically located to facilitate quick response to emergencies on the waterways and for proximity to riverine areas of Lekki and environs, the State Government recently delivered a new ultra-modern LASEMA Response Unit (LRU), strategically located along Ikorodu Road, a central location within the Lagos Mainland. “The new Unit Situated at Onipanu, Ikorodu Road was centrally located to facilitate easy access to most Mainland areas of the State. This would complement equipment already acquired to boost the sea, air and land capabilities of our emergency responders. Aside from the already established relief camps in Agbowa and Igando, work has also commenced on the Construction of a third Relief/Rehabilitation Camp in Ibeju Lekki, which was approved by His Excellency, Mr. Akinwunmi Ambode last year to cater for people in the senatorial district,” Tiamiyu said. He added that in furtherance to the need to provide proper extrication equipment for timely rescue of trapped victims in any form of life-threatening emergencies, LASEMA in February, 2018, procured Light Rescue Equipment, which included Hydraulic rescue equipment with Power Unit attached with Spreader, Rescue Ram, Cutters Combi Tools, and Concrete Cutters distributed to all the dispatch centres. “The procurement of BMW Power Bikes have also been launched which are usually deployed at making on-spot reconnaissance assessments of incidents with a view to unambiguously determine the type and quantities of equipment to be deployed for a given incident and also to improve monitoring and surveillance. He said the Power Bikes have been deployed to various locations in the State, adding that the agency is proactive, hence, rather than wait for emergencies to occur, it has taken the step to dispatch the bikes to strategic locations across the State especially on the Third Mainland Bridge. “LASEMA, in the last one year had responded to numerous fire incidents, road accidents, flooding, illegal parked trucks, gas explosion/emission amongst other emergencies in record time, thereby saving lots of lives and properties worth millions of naira. 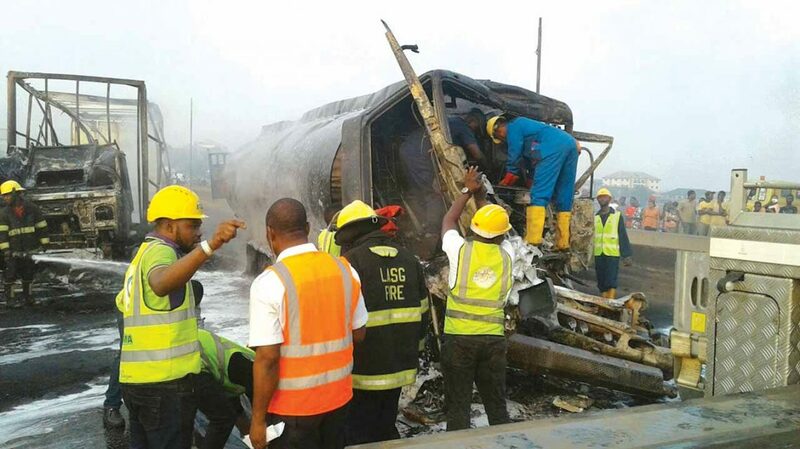 “Lagosians can recall the unfortunate on Thursday, June 29 when a fuel laden tanker exploded on Otedola Bridge. It was a litmus test, but through coordination of all agencies concerned, we were able to minimise the impact,” the LASEMA boss said. Besides, he said the agency has also extended its response to emergencies beyond Lagos even up to Redemption Camp, adding that in most cases, accidents along the Lagos-Ibadan Expressway stretches into Lagos thereby affecting residents who work in Lagos but live in border towns including Magboro, Arepo, Kara, among others. He also added that about 70 ad hoc staff of the agency were last year absorbed into the State civil service, while special allowance are paid to the staff, a development, he said was to get the best out of the workers who have demonstrated uncommon dedication and commitment to duty.